The Weaver Steel Lock Mount See-Thru Riflescope Rings for 1" Ruger 10/22, (Stainless Steel) mount directly on your Ruger 10/22, and affix your riflescope firmly with two straps and four screws, for each of the two rings, without the need for a base. It allows you to choose between the iron sight for close shots or the scope for distant shots. 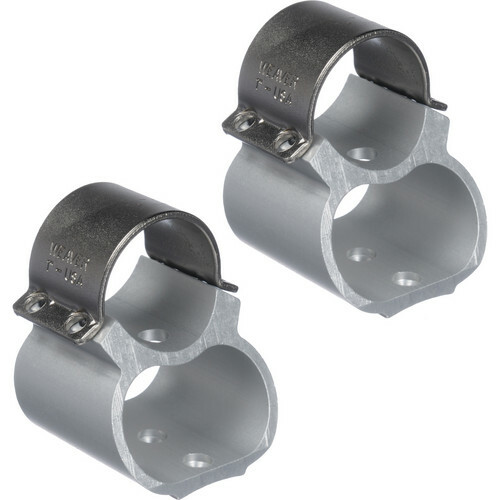 These rings enable you to move your scope forward or back for optimum placement. A simple thumscrew on each ring enables easy mounting and removal. Box Dimensions (LxWxH) 4.5 x 3.45 x 1.55"
Steel Lock Mount See-Thru Riflescope Rings for 1" Ruger 10/22 (Stainless Steel) is rated 5.0 out of 5 by 2. Rated 5 out of 5 by Gabe from Excellent Buy Who would have thought of finding this riflescope rings here, but I did. The price is right and the shipping is fast. I have bought from this place before and will continue to do so in the future. Rated 5 out of 5 by WILDBILL from Weaver see thru mounts for Ruger 10/22 Perfect fit and easy installation. just right for use with my iron sight/laser combo sights.Finish goes well with the guns stainless finish.Price and availability were right also.I'm still waiting to be notified that the place where I originally looked to get them in stock. Who'd ever think that basicaly a photo store would carry this product?